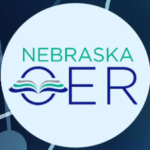 As the legislative session moves forward, many states have passed bills that will help to improve data systems and expand opportunities for learners. 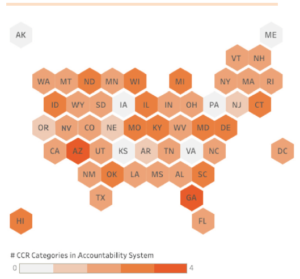 Recently, data system improvements have been a focus of policy efforts in order to better support and hold accountable districts, institutions and programs, as well as allow learners, employers and policymakers to stay informed. In the District of Columbia, the Council of the District of Columbia passed the Workforce Development Systems Transparency Act, which requires the District’s Workforce Investment Council to detail the District’s spending on adult education programs and workforce development education programs, as well as the performance outcomes of those programs, in a public report. 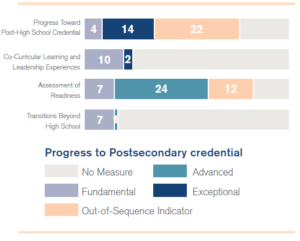 The performance outcomes information will include employment rates, median earnings, credential attainment, and completion rates. The first version of the report will include information about programs managed by seven DC entities, such as the Department of Employment Resources, and by 2020 programs administered by an additional 14 entities will be included in the report. In Texas, the University of Texas System launched an updated version of the database Seek UT to include University of Texas graduates’ earnings in the hopes of showing the benefits of higher education. The database utilizes Census Bureau data and provides information on student’s median incomes for every program offered after one, five, and ten years after graduating, the percentage of students who went on to continue their education and the median loan debt for different programs. The database is viewed as a “work-around” of the current ban on a federal database that would link student-level education data to national employment data. Elsewhere, states are passing laws to expand community college offerings and to address the shortage of skilled employees. In Colorado, a bill that allows Colorado’s community colleges to offer bachelor’s degrees in nursing recently became law. The bill was passed without the governor’s signature or veto. In a letter explaining this decision, Governor Hickenlooper cited concerns over limited stakeholder engagement by the bill’s proponents and potential conflicts between the various agencies that oversee higher education in the state. In response to these concerns, the letter directs the Colorado Commission on Higher Education (CCHE) to convene stakeholders to determine how to best align programs with industry trends. This law was allowed to pass in response to a severe shortage of nurses in Colorado and after reports that more nursing disciplines require a masters or doctoral degree than in previous years. Similarly, in Ohio, three community colleges received state approval to offer bachelor’s degrees in microelectronic manufacturing, aviation, unmanned aerial systems, land surveying and culinary and food science. These programs still need to receive accreditation from the Higher Learning Commission before the community colleges can offer the degrees. Once accredited, these programs will help to achieve Ohio Governor Kasich’s goal to have 65 percent of the state’s workforce earn an industry recognized credential or degree by 2025. Governor Kasich has already showcased his support for community colleges to offer baccalaureates through the introduction and passage of legislation that supports this. 2017 was a banner year for Career Technical Education (CTE). Overall, 49 states and the District of Columbia passed a total of 241 policies related to CTE and career readiness, a marked increase from 2016. But while it is encouraging to see a groundswell of enthusiasm for CTE at the local, state and national levels, how will states leverage CTE’s momentum and ensure that state action translates to better outcomes for students? Funding was at the top of the list for the fifth year in a row. Policies in this category include a $16 million one-time appropriation for CTE equipment grants in Tennessee, the development of a productivity-based funding index for Arkansas institutions of higher education and a workforce development scholarship authorized through Maryland’s More Jobs for Marylanders Act of 2017. With few exceptions, state legislatures renewed or increased appropriations for CTE programs and related activities. There was also a lot of activity related to data, reporting and accountability, largely due to state work around the Every Student Succeeds Act (ESSA). 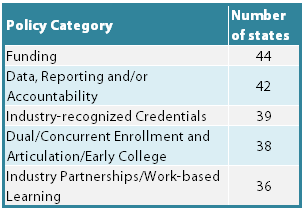 In 2017, 35 states identified measures of career readiness in their federal accountability systems, and many of these measures included industry-recognized credential attainment, dual-credit completion and work-based learning participation. 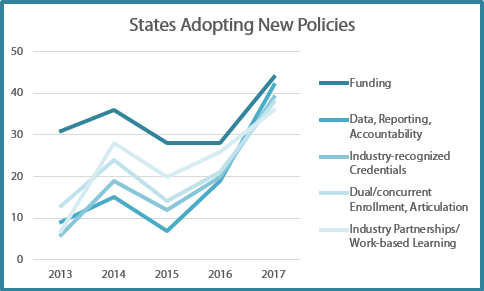 While 2017 set a new high-water mark for state activity, a look across the past five years of this report illustrates that states are doubling down on a few policy priorities. With the exception of 2015—when fewer states passed policies related to Industry-recognized Credentials or Data, Reporting and Accountability—these five policy areas have been the top priorities for states every year that this report has been published. This is no surprise, given that much of the conversation in the CTE field over the past five years has centered around accountability, credentials of value, dual enrollment and work-based learning. Even compared to recent years, states were more active in 2017, and there was a spike in the number of states adopting new legislation or rules in these policy areas. 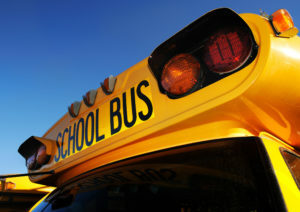 So what lessons can be drawn from this year’s state policy review? For one, the enthusiasm for CTE is real. 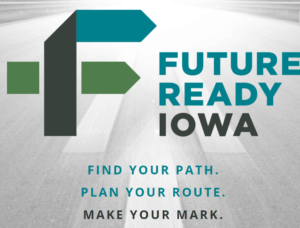 State legislatures, governors and boards of education are coming to recognize what the CTE community has known for years: that high-quality career preparation helps learners develop academic, technical and professional skills and results in positive rates of graduation, postsecondary enrollment and completion, and ultimately career success. But it is also important to make a distinction between the quantity of policies passed and the quality of their implementation. 2017 was a record year for state CTE policy, but now comes the true test. 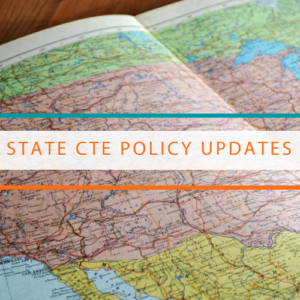 State leaders should follow through on the policy commitments made in 2017 by sustaining funding for critical programs, identifying and adopting policies to ensure CTE quality, and taking time to evaluate the implementation and effectiveness of existing policies. 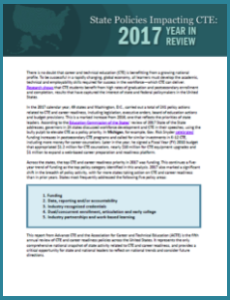 A copy of the report, State Policies Impacting CTE: 2017 Year in Review, is accessible in the Learning that Works Resource Center. Advance CTE and ACTE are also hosting a webinar on January 31, to unpack findings from this year’s review (registration for the webinar is at capacity, but a recording will be available following the webinar at https://careertech.org/webinars).